Nevada's Manhattan is no Big Apple. In fact, you can barely call it a town since it can only claim a few dozen permanent residents and its only businesses are a couple of old saloons. But that doesn't mean the old mining town doesn't have plenty of offer. It's brimming with history and at least a few colorful anecdotes. During the past century, more than $10 million in gold and silver was mined in Manhattan, which is located about 45 miles north of Tonopah via State Route 376 and 377. According to ghost town historian Shawn Hall (author of several excellent Nevada ghost town books including, “Preserving the Glory Days: Ghost Towns and Mining Camps of Nye County, Nevada”), George Nicholl discovered silver in the Manhattan area in 1866. Within a short time, more than four dozen claims were staked in the area, including the Mohawk and Black Hawk mines. The district’s mines were played out within a few years and by 1869 the area was abandoned. Between 1877 and 1904, the district was periodically re-worked. In 1905, cowboy John Humphrey, who worked at a ranch in the nearby Big Smoky Valley, found a valuable outcropping of ore that sparked a new boom. Within a year, the town of Manhattan had sprouted into existence with about 1,000 residents. The community soon had saloons, hotels, banks and other businesses. A post office opened on Christmas Day in 1905. As with many early 20th century Nevada mining camps, the San Francisco earthquake in 1906 severely affected investment in Manhattan and signaled the start of the end of the town’s second boom. The population plummeted from a high of about 4,000 people to a few hundred, who scrambled to survive. The discovery of large gold deposits in 1909, however, again revived the town. Manhattan managed to prosper into the 1920s, when the ore began to fail and fires destroyed much of the downtown. In 1939, a 3000-ton gold dredge was built below the town in the Manhattan Gulch (site of the original silver discovery). The operation, which included a large pond created from water piped from nearby Peavine Creek, flourished until 1947, when the dredge was removed. In 1979, a massive open pit heap-leeching mine began operating in the area. Today, visitors will find that despite neglect and the destruction of much of its original mining district by more recent open-pit mining, Manhattan still has a handful of historic buildings and sites worth seeing. 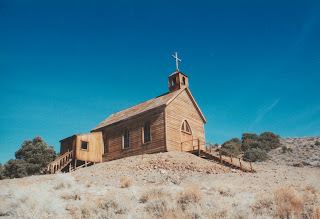 Perhaps the best of Manhattan’s hearty survivors is the picturesque frontier-style wooden Manhattan Catholic Church, sitting on a hillside overlooking the town. Built in 1874 in nearby Belmont, the classic old west church was abandoned by 1901 and moved to Manhattan in 1908. In recent years, the old church has been restored and maintained by local residents and it remains a popular place for rural weddings. A drive down the town’s main street is a chance to see a few intact, ancient buildings and homes, some dilapidated ruins, lots of abandoned vehicles and equipment and the two saloons. The roofless Nye and Ormsby Bank Building is work a look. Inside its stone walls you can still find the original vault with its thick doors intact—no money, unfortunately—and the remnants of rickety wooden floors. At the entrance of town, you can still find about a half dozen decaying, wooden headframes perched on the hillsides. The Manhattan Cemetery, about a half-mile west of the town, is also worth exploring. For more information about Manhattan contact the Tonopah Chamber of Commerce, 775-482-3859. “Which is it? Right or left?” I asked, glancing at Julia as she stared intently at the screen of the cell phone-sized device in her hand. Left took us into the parking lot of a landscaping company. Water bubbled from rock fountains on display. Julia and I were embarking on our first geocaching expedition. Recently, I had purchased a GPS (global positioning system) unit. This electronic device receives signals from satellites and locates geographic coordinates (usually to within six to 10 feet). In recent years, the sport of geocaching—a kind of high-tech treasure hunt—has cropped up. For those not yet addicted to this sport it works like this: Geocachers hide a metal or plastic receptacle (known as a cache) filled with pens, pins, pliers, and other inexpensive trinkets. The cache hider gives it a funny name and posts the coordinates for its location on the official geocaching web site, www.geocaching.com, or www.nevadageocaching.com. Cache hunters punch those coordinates into their GPS units and follow the electronic prompts to the site. Geocaching traces its roots to May 1, 2000, when the federal government relaxed regulations regarding public use of global positioning satellites, which only the military could use previously. Within days, the first cache was hidden near Portland, Oregon, and a new sport was born. Although geocachers are casual by nature, there is an etiquette that all players follow. If you take something from the cache, you replace it with an item. There is also a logbook inside each cache to record the date of your find and other observations. wandering around, following prompts from the GPS, and discovering a half-hidden coffee can filled with nearly-worthless treasures. When my daughter and I decided to take that first geocache outing in Huffaker Hills, we checked the Web site for caches within a mile of our Reno home. May daughter thought the “Indiana Jones” cache had the coolest name, so we decided to make that our first hunt. After we had parked in the landscapers’ parking lot,, we stood at the base of the hill. The GPS indicated that, yes, the Fortress of Doom was straight up, so we began to climb through the sagebrush. The terrain became rockier, dustier, and steeper. The GPS pointed us up the hill. I wondered if this had been such a good idea. My daughter complained that the rocks hurt her feet, and I saw nothing that resembled the photos on the Web site. When we stopped to catch our breath, I spotted a wall of dark rocks in a semicircle near the top. It had to be the Fortress of Doom. With renewed energy, we scampered over the rocks to the stone walls. The GPS told us we were within five feet of the coordinates—but where was the cache? We searched inside the crude rock walls. We climbed down a series of boulders and scanned the hillside. The view was spectacular, with the south Truckee Meadows spread out below and Mount Rose to the west. My daughter sighed. After all our hard work, she feared we wouldn’t find the cache. I turned to reassure her and noticed a metal container in the rock wall behind her head. It was the cache. We pulled out the box and opened it. Inside we found several pens, toy cars, luggage locks, and other gee-gaws. She took the luggage locks and replaced it with a clip-on clock that we had brought with us. I entered our names in the log. Web sites—The best geocaching Web sites are www.geocaching.com and www.nevadageocaching.com. The former has an excellent section for beginners. It wasn’t easy building a place to live in the mining town of Shoshone. Founded in 1910 by Death Valley prospector, Ralph “Dad” Fairbanks, the area had little in the way of building materials. So residents got creative—they built homes into the stone walls of nearby Dublin Gulch. 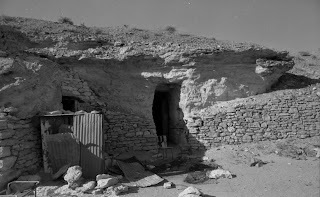 The small stone cubicles—which resemble latter-day pueblo dwellings—included square window holes and even shelves carved in the walls. The homes are just another example of the unusual building materials used in Nevada's mining camps. Because of the scarcity of brick and wood, prospectors were forced to use unusual materials such as empty bottles, metal scraps, cardboard, canvas, sod and, in the case of Shoshone, sandstone. Wandering through Shoshone's rock condos is interesting. Inside, the homes are surprisingly roomy and cool. Most have stovepipe holes cut into the ceilings, showing that stoves were common. A few still have the rusted remains of bed frames. One of the apartments was built on two levels, kind of a two-story stone townhouse. Cut steps lead from the lower level to the upper floor. The miners weren't much for cleanliness. The center of the gulch is littered with the rusted remains of cans and other assorted garbage. Rather than develop a garbage area away from their homes, the miners used to toss their trash out the front door into the sagebrush and locals have kept the site in its original condition. The stone quarters were used as housing for miners (and, later, vagabonds) until the 1970s. Several famous folks have been rumored to have stayed in them, including miner “Shorty” Harris, who founded the mining town of Rhyolite, Nevada. A quarter-mile from the miner's housing development is a frontier cemetery with the remains of a handful of Shoshone pioneers. 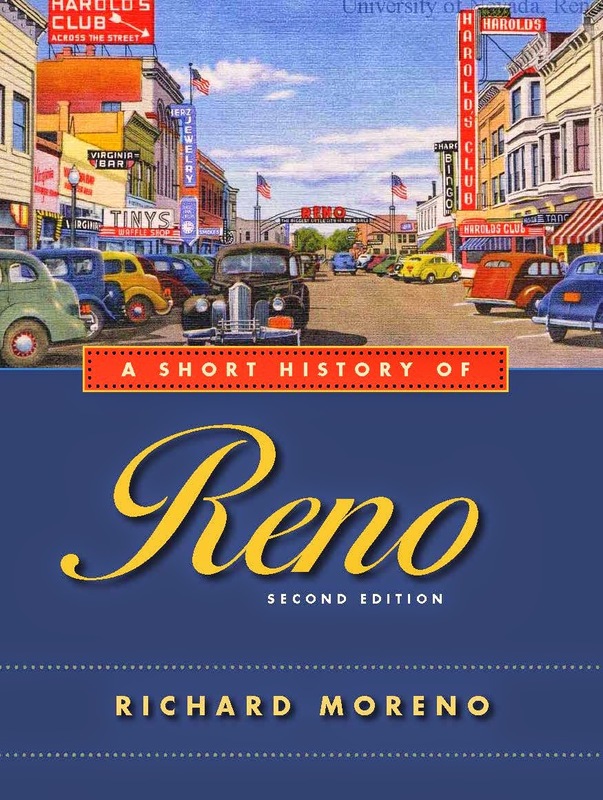 The actual town of Shoshone is located 33 miles west of Pahrump via Nevada State Route 372 and California State Route 178. The miners' stone homes sit west of the main part of the town. The rest of Shoshone, which sits near the southern edge of Death Valley National Park, consists of some half dozen buildings, including a motel, convenience store, restaurant, real estate office and a local museum. The latter offers a glimpse into the community's past. Originally built in 1906 in another mining town called Greenwater, the building was moved in 1922 to Shoshone by Charles “Charlie” Brown, “Dad” Fairbanks’ son-in-law. Over the years the whitewashed wooden building served as a garage, gas station and general store before being converted into a museum. Inside, about a dozen exhibits and displays describe the history of Shoshone and the local mining industry. Adjacent to the museum is an adobe building that was once a boarding house for the Tonopah and Tidewater Railroad, which had a station in the town in the early part of the 20th century. The railroad, in fact, was the reason the town was originally settled. Charles Brown and his wife, Stella, eventually bought the town from her father and are largely responsible for its development. The town remains owned by members of the family. Brown, who served as a California State Senator for more than 24 years, died in 1962. He is buried in the local cemetery. For a nice Website photo tour of Shoshone, go to http://digital-desert.com/shoshone-ca/ or for more information, visit www.deathvalleychamber.org.